So, Passbook is perceived having a bad start. The special App Store category is mostly empty, and support in the few companies that support it seems rushed or is spotty. Implementation is not trivial, but easy enough. Passes are a zipped bundle containing images, pass data in a json structure and a cryptographic signature. Updates to passes are triggered with push notifications. Any half-asleep Java developer can whip that up during his coffee breaks. 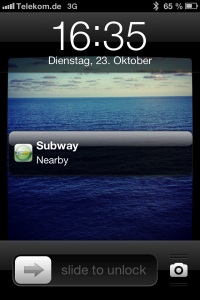 One feature that is included in Passbook but hasn’t got any attention is that they’re location-based. Any pass can contain a number of locations that will set up geofences on the iPhone and will present the user with a prompt to go into your store and spend some money when they’re nearby. 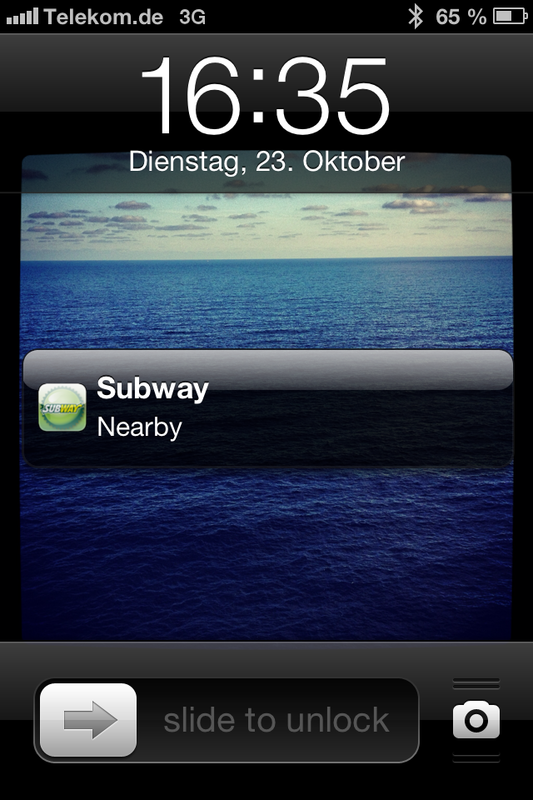 When I got close to the Subway’s location, the notification popped up silently, and when I left, it disappeared again. A loyalty card pass for a larger chain could update itself to notify the user when they’re near one of their five most frequented branches. The marketing departments should be falling over themselves to implement Passbook. Guess nobody told them, including Apple. Note that this pass is self-made and is not actually supplied by Subway.